Google Earth has revealed yet more strange patterns in the deserts of central China, but this time the researcher who found them thinks she knows why they're there. 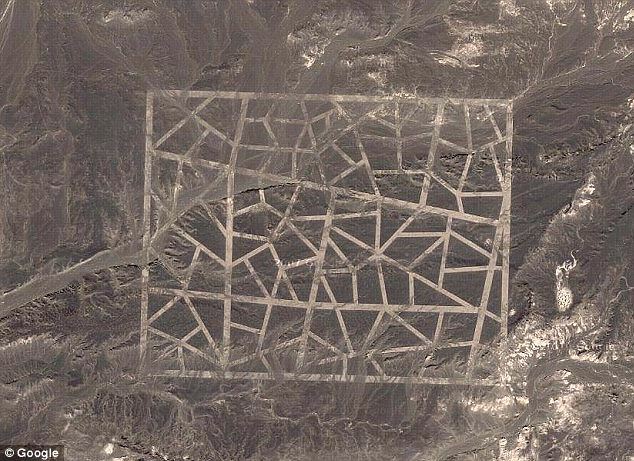 Last year MailOnline reported how a satellite spotted strange grid-like structures in the Gobi desert, a discovery which sparked a wave of fearful speculation as their purpose. Now Amelia Carolina Sparavigna, an assistant professor of physics at the Politecnico di Torino in Italy, highlighted another mysterious pattern in the Taklamakan desert in western China. She has been a pioneer of a kind of armchair archaeology using Google Earth in conjunction with open-source image processing software to track down curious structures in remote parts of the world. Her latest discovery, reported in MIT's Physics arXiv blog, is an 8km long line of squares in the desert just south of the town of Ruoqiang. Zooming in on the squares reveals them to be 40m/sq grids of what seem to be mounds or similar rough structures, arranged like a giant mountain bike tyre track rolling across the desert. Professor Sparavigna has been able to roughly date the grids, pointing out that Google Earth's satellite images, on which all the grids are visible, date back to 2004, while they are not on older images from Bing or Nokia Maps. Last year's discovery of bizarre patterns in the Gobi desert in China's north-east interior led to a number of theories as to what the secretive superpower might be up to. Guesses ranged from bizarre claims that they were 'codes' designed to be read by UFOs, to fears that they were missile practice targets modelled on U.S. cities, before researchers came to the slightly less scary conclusion that some, at least, were used to calibrate cameras in China's spy satellites. This time, however, Professor Sparavigna believes she has come up with a reasonably good guess as to the purpose of the Taklamakan grid, based on a recent announcement by the Chinese of the discovery of 1.28million tons of nickel ore reserves in the region. Her belief is that the grid is evidence of a comprehensive geological survey of that part of the desert, including the widespread digging of trenches and boreholes to map the extent of the ore seam. If she is right, this part of China seems set to become an important centre for mining.